The story of Sweetgrass Springs had some of its roots in a discovery I made on a trip through Blanco, Texas. Blanco is in the Hill Country, just like the imaginary town of Sweetgrass Springs, but what grabbed my imagination was the notion of a decommissioned courthouse, something I’ve never heard of. 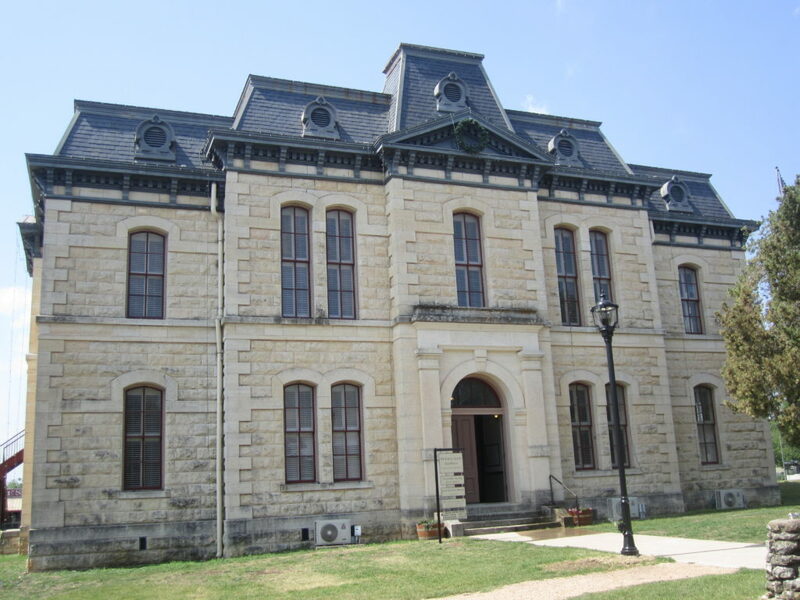 Blanco was once the county seat, but it was moved to Johnson City, leaving the former courthouse abandoned. The notion just tickled my brain and wouldn’t let go. I started thinking of a tiny dying town, of an old woman who owned the town’s only diner and who bought that old courthouse and clung to the hope that one day the town would live again. This is a photo of the actual courthouse I shamelessly adopted as mine. And thus was born the little lady with the huge heart, Ruby Gallagher, whose daughter had taken off in her teens and never come back. But every night, Ruby climbed to the top of the courthouse and looked to the distance, hoping her daughter would return. It’s sure been fun to write, Velva–thank you! Terrific background info! I do so enjoy your wonderful stories! I love historical novels. They are my favorite. What a cool courthouse! I love old courthouses, in fact when we travel and go through small towns that have one we will stop so I can take pictures. So many of them will even have a small museum inside that we will visit, giving us a chance to do a little exploring. Our town in northwest Indiana is the county seat and we have a really cool old courthouse. Will there be any new Sweetgrass Springs books coming out soon? I have read everyone of your books and your characters are like family to me. Linda, what a fun thing to do! I love driving back roads and seeing the sights. Thank you for your very kind comments about my books–I appreciate you so much! I’ll have a new series coming out, probably starting in April, called Second Chances. Nothing from Sweetgrass right now, but I do have one story in mind I’ll be working on for late this year, I hope. Thank you for asking!